Wouldn’t it be great if you didn’t have to juggle keys at the door anymore? If you are looking for a more convenient and secure way to access your home or business, one option is a fingerprint door lock. As the name implies, this is a door lock which you can open by scanning your fingerprint. 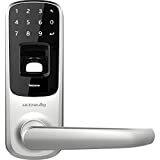 Many fingerprint door locks also allow you to store user codes to offer you alternate means of access. Some have smart lock features as well, so they can be controlled using a smartphone or tablet. Most fingerprint door locks are designed to fit a wide selection of doors, but that does not mean that every lock fits every door. When shopping for your own fingerprint door lock, ask yourself the following questions: “What is my door made of? What are its dimensions? Are the hinges located on the left or on the right? Is the door inside a building, or is it a door to the outside? Is it exposed to snow, rain, and other harsh conditions?” Then choose a lock which is fully compatible. 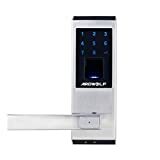 The whole point of a fingerprint door lock is that it can be unlocked by scanning any fingerprint you have stored in its database. This means that you can give personalized access to any family member, friend, employee, neighbor, guest, or acquaintance. But some fingerprint door locks go a step further. They may provide access codes, and may also open with proximity to a smartphone or fob. A fingerprint door lock may come with an optional key as well to use as a backup. Check to see what options are available. Find out how many fingerprints and/or codes you can store. Some—but not all—fingerprint door locks double as smart locks. Those which do may be compatible with a smartphone or tablet, and may also be able to work with voice control systems such as Alexa. Using smart features, you can send commands to the fingerprint lock and view logs of activity. If a smart door lock is compatible with a personal assistant, a secondary hub (a separate purchase) is generally required in order to utilize the feature. In order to make installation fast and easy, most electronic door locks are wiring-free, which means that they rely on a battery to operate. So long battery life is important, as is a low level indicator which lets you know when to change it. If you do not know when to replace the battery, you could be locked out of your home. This high-sensitivity biometric fingerprint door lock is a versatile choice which is worth considering in cases where you need to store multiple access codes and/or fingerprints. Note that it is not reversible. There is a right-handed version and a left-handed version. So pick the one that you need. There are three ways to unlock the door. The device can store up to 100 fingerprints, up to 100 user codes, and there are keys. Passage Mode is available. If you activate it, the door will open if the handle is pressed, without the need to input a fingerprint or code. There is a feature which allows you to copy the data from the lock. That way if it is lost somehow, you can load it into another A20 lock. This prevents you from having to re-scan all the fingerprints and/or set up a brand new set of user codes. The lock is powered by a high speed ST chip. Stainless steel and a high quality keypad prevent fingerprint buildup and tampering. It is easy to install the lock, but you do need to drill a hole. This is a product for interior use only. It is not waterproof, so if you try to put it on an exterior door, it may short out in the rain. 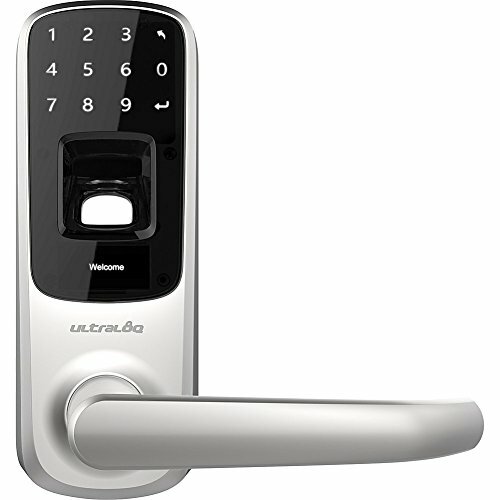 The Ultraloq UL3 BT Fingerprint Smart Door Lock is a Bluetooth-enabled lock which offers 5-in-1 functionality. There are 5 different ways to open it, with biometric fingerprint identification being just one of them. On top of that, this lock is a smart lock, so it can be controlled using a smartphone. There is an 18-month warranty on the electronic parts, and a lifetime warranty on the mechanical components. Methods you can use to open this lock include: fingerprint, code, smartphone, knock-to-open, and a backup key. With the Ultraloq app on your smartphone, you can view log data. The device offers long battery life, and sounds an alarm when the battery needs replacement. The handle is reversible, so this lock can be installed on right- and left-handed doors. The lock is weatherproof, so it can go on exterior doors. The sensor on the lock is dustproof, waterproof and scratchproof. This helps to keep the device secure while also extending its lifetime. One really cool feature is Bluetooth Low Energy. With this feature, Ultraloq will continue to function even if there is a power or internet outage. Another innovative feature is one which allows you to input any long string of digits when punching in your code. So long as you have included a correct pass code somewhere in the set, the lock will let you in. But this means if anyone is watching you or looking for wear on the touch screen, they are less likely to figure out your pass code. The batteries can last for as long as a year before they need to be replaced. Judging from customer reviews, there may be some quality issues on a small percentage of locks produced. The company is a startup, so this is not a huge surprise. The vast majority of locks seem to work phenomenally. 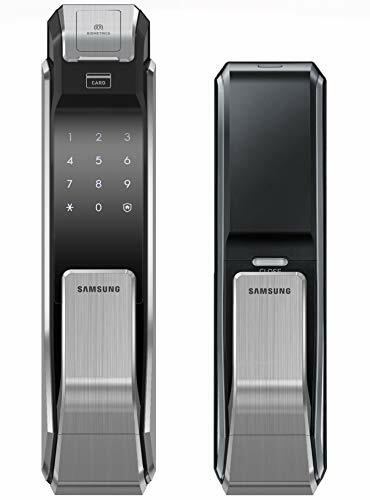 Another high-end option to consider if you are in the market for a fingerprint door lock is the Samsung SHS-P718. Samsung is of course a big name in electronics, and a trusted brand. This model fits doors with thicknesses ranging anywhere from 40-80mm, and can store up to 100 fingerprints. Open the door using your fingerprint or a user access code. User codes can be anywhere from four to 12 digits in length. Compatible with Samsung cards or key tags. Push the door from the outside or pull it from the inside to open it. Because up to 100 fingerprints can be stored, this is an ideal model for use in a business setting. The lock features a sleek modern design which looks great if you are going for a contemporary vibe. There is an option to enable Double Authentication Mode. With this mode, both a pass code and fingerprint are required in order to unlock the door. The touch panel displays messages to tell users when the door is locked and unlocked. The keypad lights up automatically when you approach the door. There are some unique special features. For example, if the lock detects high temperatures, indicating fire may be present nearby, it will unlock automatically. This lock is not designed for exterior doors. It is not waterproof, and thus needs to be used indoors only. The setup instructions are not very comprehensive, and are a bit confusing.